DeKalb County Board, by Resolution, determined that Jury Commissioners would be appointed by the Presiding Judge of the Circuit Court. The said commissioners are retained until they resign from said appointment. The Jury Commissioners are responsible for preparing a list of all potential voters possessing the necessary legal qualifications for jury duty, to be known as the jury list used for Petit, Coroner’s, and Grand Jury’s. The list may be revised and amended annually at the discretion of the Commissioners. 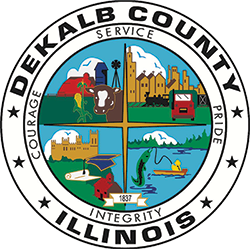 The potential jurors are chosen from a combined list of DeKalb County voters, DeKalb County State ID holders and Illinois driver’s license holders from the Secretary of State. From this combined list the potential jurors are chosen randomly by computer.